I am always looking for super fun things to do with the munchkins on the weekends. I think it is so important to schedule fun events into your family's schedule because let's be honest when you don't life's chaos takes over and the fun doesn't happen. 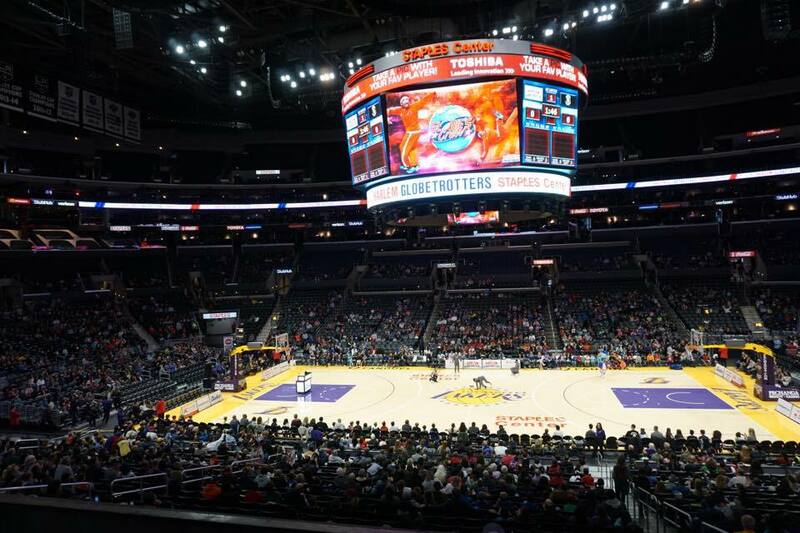 So, I was stoked when I found out that the Harlem Globetrotters were coming to Los Angeles. A few years back my husband took my 3 boys to go and see them. And, they absolutely LOVED the show. This time around I knew I wanted in on the fun and so did my daughter, Ella so I got tickets for us + Mike and my youngest son Shea. I am SO happy we went. The show was amazing and the time with my husband, Shea and Ella was the BEST!!! 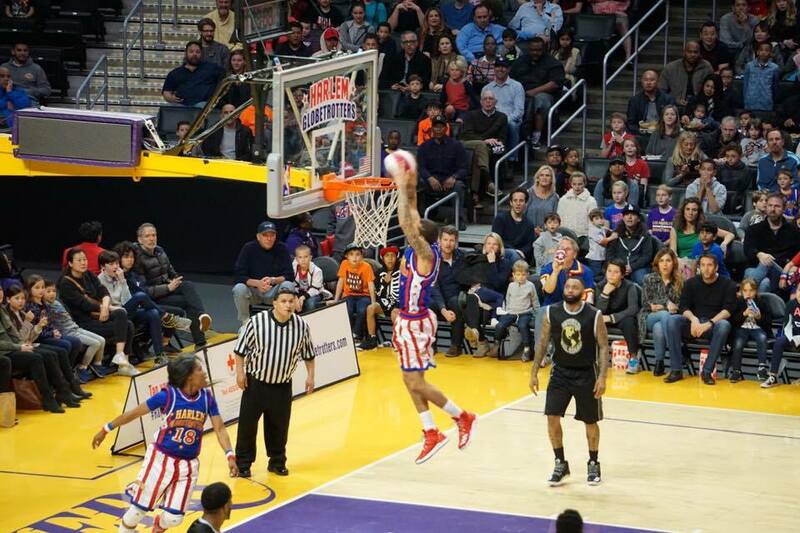 3 Reasons to Check Out the Harlem Globetrotters + 25% OFF Tickets! There are plenty of reasons to go and watch the 2017 Harlem Globetrotters World Tour when they are in town (view their schedule here). The entertainment is fantastic, the players are super positive, you get out of the house, you laugh, and you have a great time are just a few that come to mind. But, if that is not enough to convince you then read on for my top 3 reasons to check out the Harlem Globetrotters, and don't forget there is a coupon code for 25% OFF below! Like I mentioned I think it is vitally important for families to schedule in fun together. Life has just become so chaotic and fast paced and I think a lot of families are missing out on the good old fashioned fun. And, by old fashioned I am talking about the pre-electronics kind ;) Yes, our phones are amazing and it is great that your kid will leave you alone bc they are absorbed for hours in a mindless game or show on their iPad. But, how is that helping to strengthen your family bond? I think watching the Harlem Globetrotters slam dunk, dance and do tricks is a much better way to spend time together. 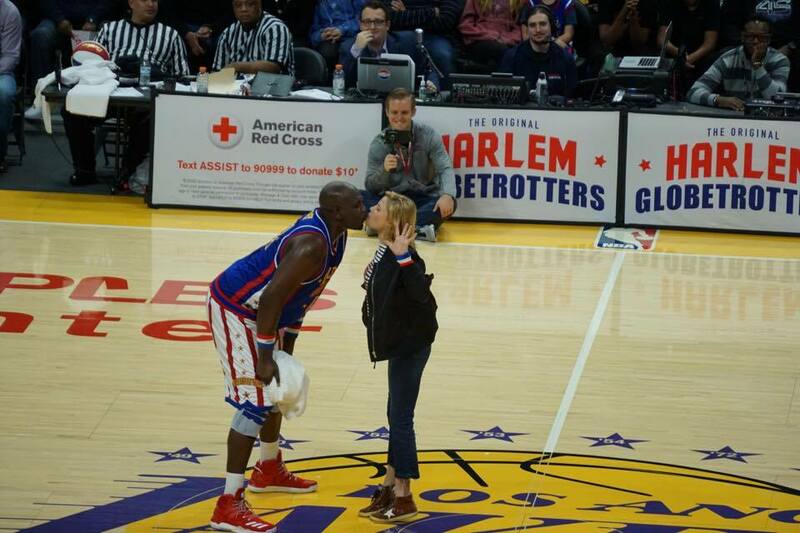 The Harlem Globetrotters had us laughing from beginning to end. They are amazing entertainers! Their comedy is fun + clean making it an amazing family-friendly event. And, they are crazy talented too. Check out their dunking skills!!! You May See Someone Famous? Okay, so maybe we just got lucky because we watched the show in LA. But, still, our kids LOVED watching "Modern Family" actress Julie Bowen get pulled out of the audience and onto the court. Although, the poor girl was hounded for photo opp's and autographs once they pointed her out, whoops! 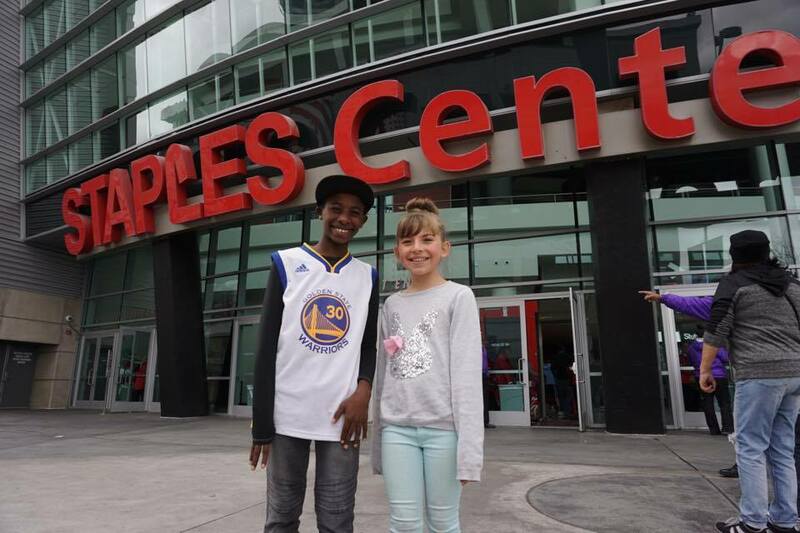 This may be my FAVORITE reason to go and see the Globetrotters with your kids. Shea and Ella were mesmerized by all the incredible tricks and stunts these guys did and as soon as they got home they hit our backyard court and tested out their own skills and tricks. It has been a few weeks and they are still sharpening their skills and putting on shows for the rest of us. It's super cute! And, I LOVE that they are enthusiastic about playing outside again. It is definitely worth a shot! *A special thanks to the Harlem Globetrotters and US Family Guide for hosting the munchkins. All thoughts and opinions, as always, are 100% my own.